The video on the right shows an on-the-fly (FBP) reconstruction and visualization of a head acquired by a C-arm CT system. 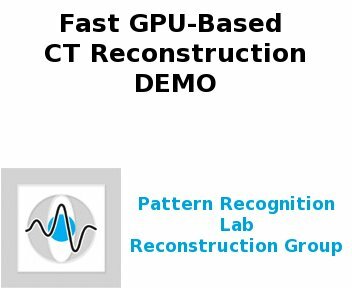 The reconstruction and visualization was performed on first generation CUDA-capable graphics cards by NVIDIA a GeForce 8800 GTX with 768MB memory. The reconstructed volume is a 5123-cube using floats (512MB). For the reconstruction 414 projections, each a size of 10242 floating-point pixels, were streamed onto the graphics card and than back-projected on the volume. Details about the implementation and reconstruction speed can be found in our paper. Note that the direkt visualization of a slices during reconstruction reduces the computational speed due to extra costs. After all projections are back-projected we slide through the volume to show that not only one slice was reconstructed.